Slicing 1126km through the centre of Australia from Laverton in central Western Australia to Yulara near Uluru in the Northern Territory, the Great Central Road (GCR) is Australia’s longest unsealed, caravan-capable ‘highway’, making it a box to be ticked on every adventurous caravanner’s bucket list. 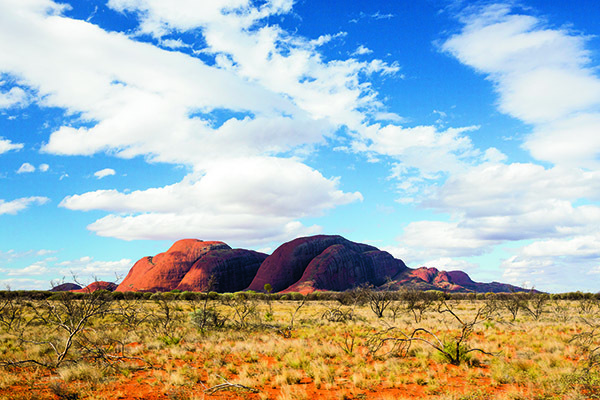 But the clock is counting down on this quintessential outback experience. Not only is a $75 million road-making program diminishing its difficulty every year but, if you believe the proponents of the ‘Outback Way’, its full 2800km route from Laverton, WA, to Winton, Qld, could be fully signed, sealed and delivered by the late 2020s. The reasons behind the advancing bitumen are not just to please the thousands of tourists who travel this major trans-continental road each year but, more importantly, road freight. Draw a straight line between the north Queensland food bowl capitals of Cairns/Townsville and Perth, and you’ll find it passes smack-bang through Alice Springs. As a result, the GCR is being maintained in better condition each year by the WA government via the rural shires it passes through, with the notable exception being the final 200km of its eastern end after it crosses the NT border. There, the broad and fairly evenly graded road erupts into rough central corrugations with steeply banked, but invitingly smooth and sandy edges until it meets the bitumen near Kata Tjuta but, according to locals, there’s a good explanation. In our case, the need to ride the GCR was much more pragmatic. We wanted to cross the widest part of Australia from west to east to test the strength and suitability for all-roads Australian touring of two prototype Bailey Rangefinder caravans, and travelling via the GCR was the shortest route. April to October is the best time to travel here, when it is cooler and there is less chance of road closures due to rain. In our case, we hit the GCR in the third week of August and, thanks to the work by several graders we saw in action, it was in excellent condition from the point where the bitumen ends on the outskirts of Laverton up to the Territory border. 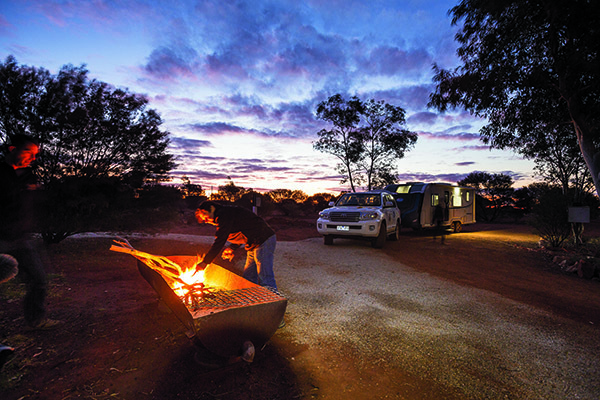 Although still recommended only for 4WDs, the road is now graded to a standard suitable for 2WDs and caravans in the dry months, with an estimated 10,000 vehicles – mainly solo 4WDs or those towing camper trailers – travelling it annually. We saw just three caravans during our crossing. Like most of Australia’s great outback roads, the GCR is a relatively new creation. 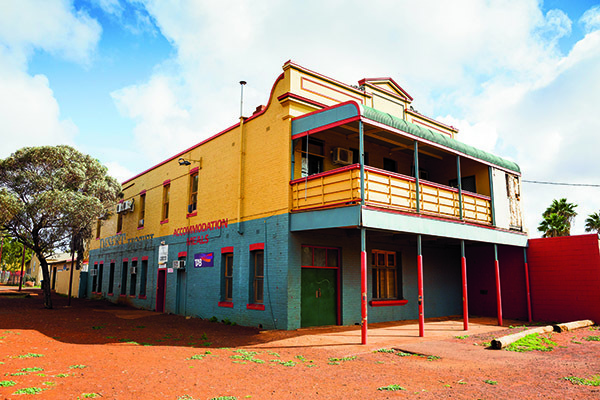 Its origins date back to the early 1930s when Warburton was established as an Aboriginal missionary settlement and supplies were delivered from Laverton via a rough bush track. By the mid-1950s, the track from Laverton had become graded dirt; however, in 1958 during his survey as part of the Woomera rocket range project, explorer and road maker Len Beadell visited Warburton and built a new road from the weather station he established at Giles via the Rawlinson Range to Warburton. Because of its remoteness, a certain degree of pre-planning is required before you tackle the GCR, particularly if you’re towing a van. For a start, as the road passes directly through Aboriginal reserves, you need a valid permit. You’ll also need to pre-plan your fuel requirements as this is truly a remote area in which conditions can change rapidly and traffic virtually stops from mid-afternoon each day. Unleaded petrol or unleaded substitute (OPAL) and diesel are available at roadhouses about 250-350km apart. Most are open during daylight hours only. LPG is only available at Yulara and Alice Springs. It is recommended vehicles carry sufficient fuel to travel at least 500-600km. 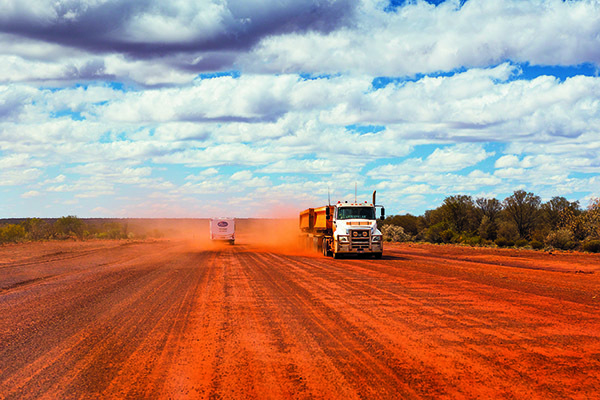 Travelling east from Laverton, there are fuel supplies at Cosmo Newbery (85km), Tjukayirla Roadhouse (300km), Warburton (560km), Warakurna Roadhouse (786km), Docker River (890km) and Yulara (1126km). Don’t expect discount fuel at any of them and budget for double what you would in a capital city. The most expensive we saw was $2.40/L. Hema’s excellent Great Desert Tracks Maps and its HN7 Navigator GPS, that we used throughout our trip, show the individual opening hours and also include contact phone numbers for ‘pumps’ and ‘parks’. Your mobile phone will be of little use to you on the GCR, but a good UHF radio with an external high gain antenna will help you keep abreast of conditions ahead via fellow travellers, while also allowing you to get a message out in an emergency. Don’t be fooled, as many people are, that travelling in the centre of Australia is going to be warm. It got down to single digits many nights and we had three days in a row where the temperature didn’t top 15°C. Laverton, in the Goldfields-Esperance region of WA, is where the adventure starts if you’re travelling east, as we were. Located at the western edge of the Great Victoria Desert, it is 957km north-east of Perth. 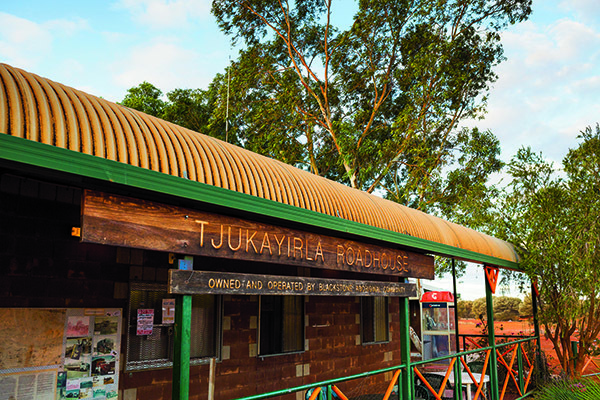 Just over 300km into the trip you come to the Tjukayirla Roadhouse, which takes a certain twist of the mouth to pronounce (the closest we could achieve was ‘Chook-la’). This roadhouse takes its name from the Tjukayirla Rockholes, situated at the south-west end of the excellent and relatively lush campground, while adjacent to the rockholes is the Paine and Barclay surveyor marker that was placed by the surveyors in the early 1930s during the original survey route to Warburton. A breakaway on the southern side of the roadhouse is affectionately known as ‘the Zoo’, due to the animals that can be seen in the shapes of the rocks. There are also escarpment caves within 5km of the roadhouse. Empress Springs are located 60km north along the David Carnegie Road (marked as 4WD only), the junction of which is 15km west of the roadhouse. The springs are inside a cave, with access via a chain ladder. Lasseter’s Cave and the Petermann Ranges are worth a visit, as is the Giles Weather Station, where Len Beadell established the still-operational weather station to monitor upper atmosphere weather activity prior to the detonation of the second British atomic bomb at Maralinga. The visit to Giles is doubly rewarding because there you will find Beadell’s original ‘Gunbarrel Highway Construction Company’ grader in a caged display, while the station has been turned into a free museum with lots of information about Beadell and the huge network of outback roads he created in the 1950s and early 1960s. The ochre bluff of Giles Breakaway, Lake Throssell, Yeo Lake Nature Reserve and Peegull Waterhole are also worth locating and visiting. One of the most frequent questions that travellers on these unsealed roads ask is what tyre pressures should be run in tow cars and caravans. At Laverton, we bumped into Len Beadell’s daughter Connie-Sue Beadell, after whom one of Australia’s great 4WD-only tracks is named, and her partner and experienced outback traveller Mick Hutton. We took his advice and this corresponded to just 20psi in the 205/70R15 Light Truck tyres fitted to our Bailey Rangefinder caravans and 20psi (front) and 25psi (rear) for the 285/60R18 Dunlop Grandtrek tyres fitted to our two Toyota LandCruiser 200 Series V8 turbodiesels. The advice was good and it served us well for the next 1100km, giving the caravans an easier ride over the corrugations than they might have expected and delivering total confidence in the LandCruisers’ handling. However, I should qualify that advice by saying the GCR is predominantly a straight road and the ambient temperature peaked in the high 20s. If the road was twisting, we might have added another 5psi, whereas, if temperatures were in the high 30s, we would monitor pressures closely to ensure the tyres did not overheat. Our tyres were also new and, hence, full-depth and flexible. If your tyres are older and have hardened in the sun, you could risk sidewall cracking when running very low pressures. In short, all advice must be tempered by the conditions and common sense. Many people complain about the NT section of the GCR. In fact, the caravan park operator at Laverton told us we would be crawling at 20km/h over the final 200km! Fortunately, he was wrong. True, the central part of the broad road from Docker River to Kata Tjuta is corrugated down its spine, but we rode the sandy windrow edges and found that our comfortable travelling speed was 50-60km/h. This means travelling at an unusual angle from time to time, as the height of the roadside dunes increased, but there were few tyre-damaging stones there and our speed was slow enough to avoid those that were! When crossing state borders and entering Aboriginal land, you need to be aware of special requirements and what is available along the way. Community-based stores at Warburton, Warakurna, Docker River and Atitjere stock fresh produce and frozen foods. Laverton, Boulia and Winton have general stores or supermarkets with a wide variety of groceries, fresh produce and essential foods, but if you want a heartier or healthier option, it’s best to BYO. When heading west from the NT to Laverton, there is an amnesty bin for Quarantine WA. All west-bound vehicles are required to dispose of all quarantine risk material stated on the sign, including all fresh fruit, vegetables, honey, seed, potatoes, onions and other such plants. But these are small imposts for the pleasure and privilege of riding one of the world’s great remote area roads. The Great Central Road stretches from Laverton in WA to Yulara in the NT. Laverton is around 960km north-east of Perth or around 360km north of Kalgoorlie. 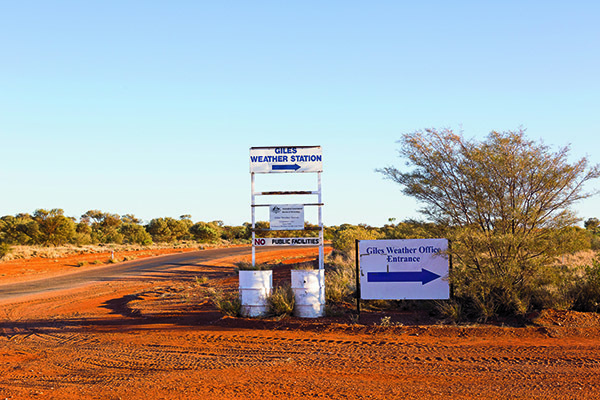 Permits are required to travel from Laverton to the WA border from the Department of Indigenous Affairs, (08) 6551 8024, and Yulara to the WA Border from the Central Land Council, (08) 8951 6320. 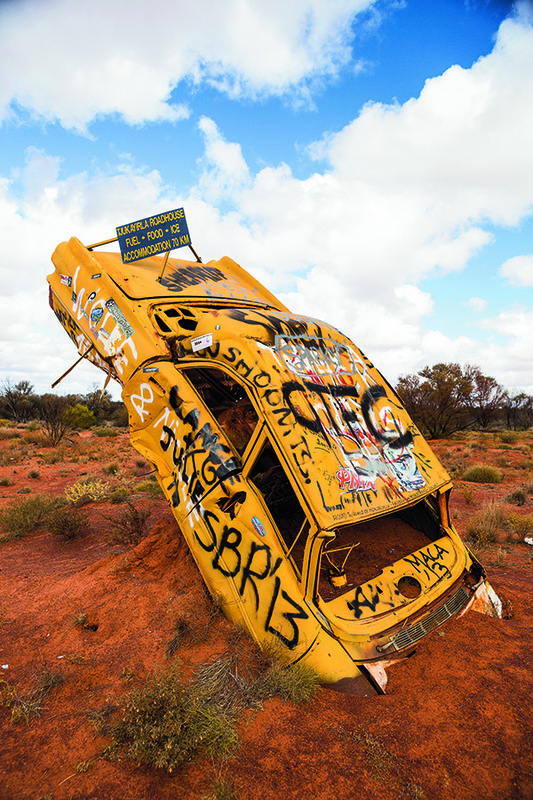 ATMs can sometimes be inoperable or unavailable in the outback. Travellers should have sufficient cash to refuel their vehicle two to three times and to pay for accommodation and provisions. Similarly, vehicle repairs, if required, might be more easily arranged with cash than a credit card. 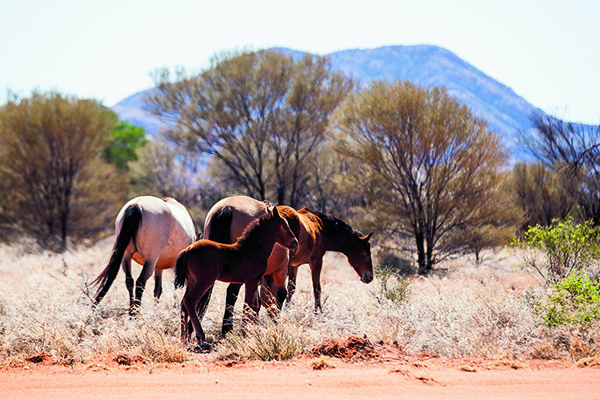 Travel information can be accessed at visitor centres at Laverton, Alice Springs, Boulia and Winton; Outback Way Atlas and Guidebook available from visitor centres, online and wherever Hema maps are sold. The full feature appeared in Caravan World #544 December 2015. Subscribe today for the latest caravan reviews and news every month!